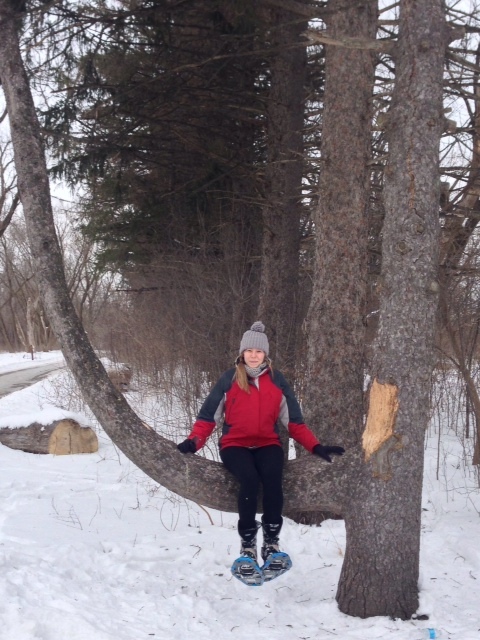 Finally I got a chance to snowshoe! Dave and I went together for Valentine’s Day. We’re so romantical! Technically it was the day after but who’s keeping track? 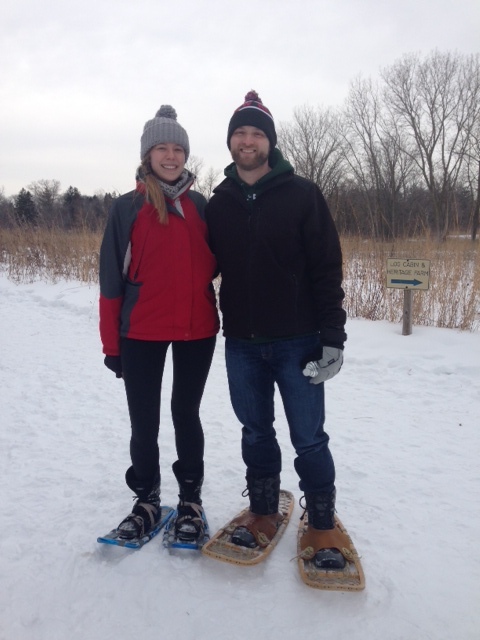 I was all worried I’d need to learn how to snowshoe. I actually found a free class that REI puts on at their stores, but then decided it can’t be that complicated and to just go for it instead. I’m glad I didn’t take the time to do that because it’s actually very easy! 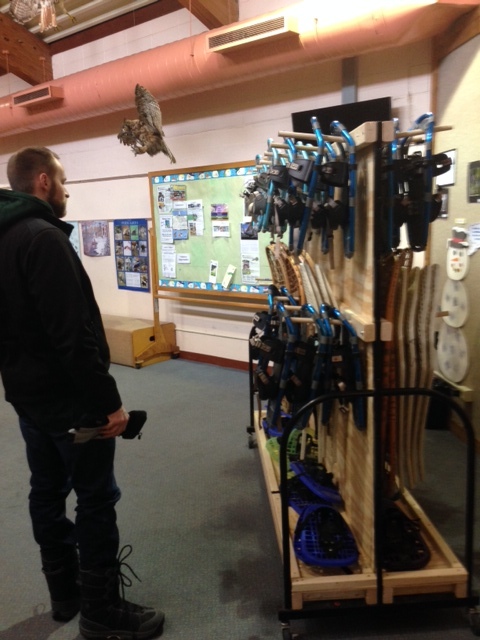 We went to the The Vera Meineke Nature Center on Schaumburg Road where you can rent snowshoes for $4.00/3 hours. It’s a great deal! Especially because they have a few different kinds of shoes to chose from. The old fashioned wooden type or the more modern aluminum model. They had us watch a thrilling 5 minute video on how to snowshoe and soon we were fitting ourselves with our shoes. Dave ended up with the old fashioned version because they fit his boots better and I ended up in the modern kind. We headed out into the snow, had someone take our photo so we could document the trip, and started exploring the area. There were a few other people around but it wasn’t crowded at all. 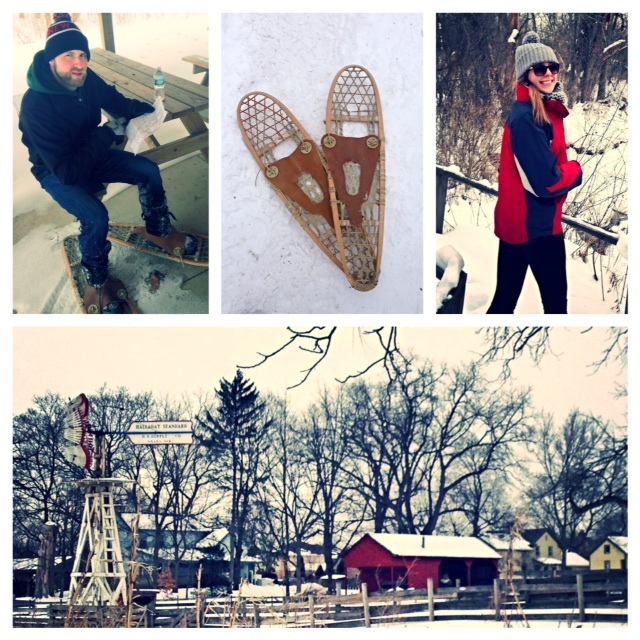 We explored a bit and found a little cabin on the grounds, a couple of bridges, and a quaint little farm. Even though it was frigid out, we really worked up a sweat and the next day my legs were pretty sore. Seems like a good way to stay in shape while enjoying the outdoors. It was a nice change of pace for us because we really haven’t spent anytime outside since the fall. We both agreed that even with the cold weather we should get out more often. Matt and I decided we would switch each year the planning responsibility of Valentine’s Day. And 2014 was my year. Since it’s our first year being married, I wanted to do something special – a really nice meal and some type of activity. First, the meal. Because food is way too important to be second in my book! After reading Chicago Magazine’s top twenty steak restaurants in Chicago, I immediately had an epiphany. Matt’s favorite meal is steak and I would be a fool to pass up a listing of 20 possibilities! Off to OpenTable I fled to see about reservations at David Burke’s Primehouse (the number one steak house rated by Chicago magazine). Wanting to avoid crowds, fights for parking spaces and pre-fixed menus I opted for a Saturday night reservation at 6:15 p.m. The activity part was proving difficult. With the unpredictability of the winter weather, I was limited to a few options. That was until my boss gave me tickets to the Chicago Auto Show. Problem solved! Steak and cars? I thought to myself, I totally have this Valentine’s Day in the bag! 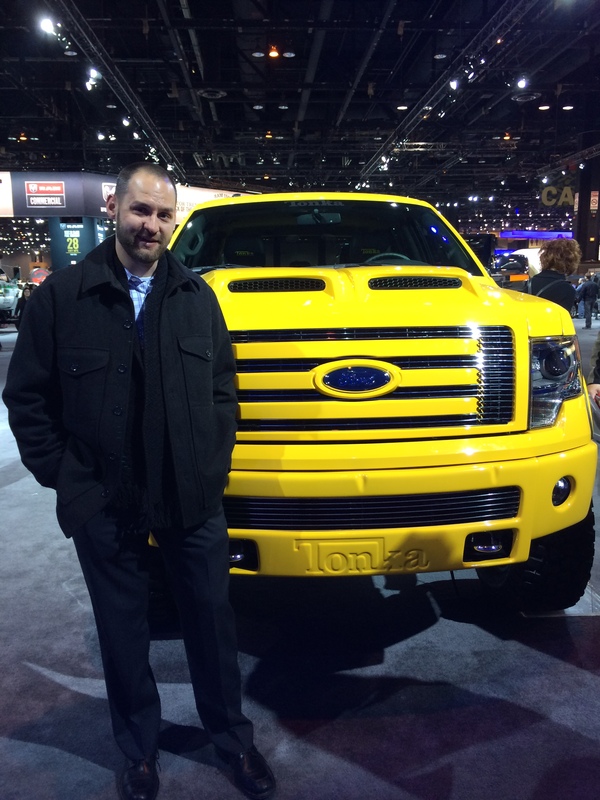 This past Saturday afternoon, we drove down to McCormick Place. With free tickets, our only out of pocket expense was a reasonable flat fee of $14 for parking. Ford with a display of unique vehicles including their police line, a Tonka truck and a few Mustangs. Being able to sit in a variety of cars from Ford, Nissan to Volvo, BMW and more! Driving courses. Toyota hauled in at least a ton of dirt to create an course that you could drive through with a variety of their SUV’s and trucks. Jeep did something similar but less dirt and more like a car on a platform roller coaster. Unfortunately the lines were way too long and we had a dinner reservation to keep! David Burke’s Primehouse offers reasonably priced valet parking or there is a public parking garage on the same block as the restaurant. We arrived ten minutes early and to my surprised were seated immediately. Our waiter was very friendly and attentive. He explained all the specials and his favorites dishes. Our meal began with signature cocktails, bacon sticks and surf and turf dumplings. The bacon sticks were AMAZING. 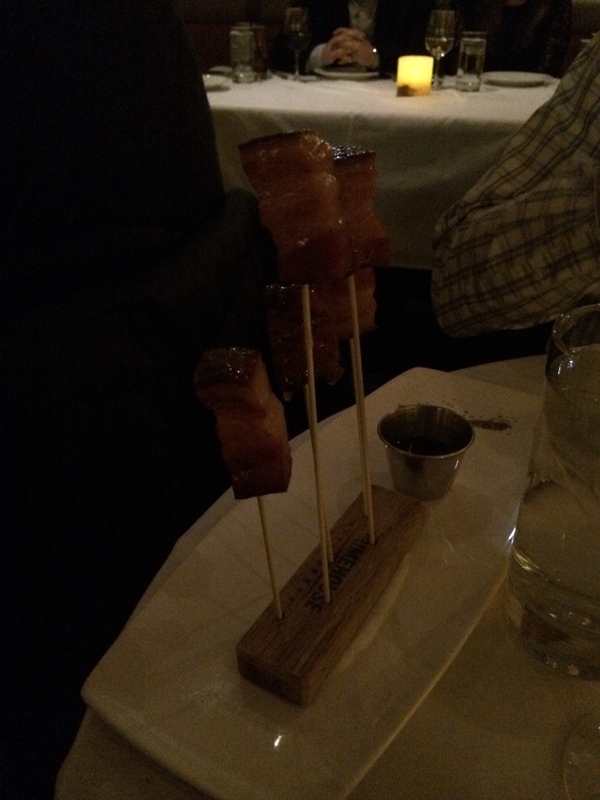 You MUST get these if you go to David Burke’s. The turf dumplings weren’t too special, and probably the most lackluster dish out of our meal. The main course for Matt included a 55 day ribeye (which was named by Chicago Magazine as the best dry-aged steak and I went with the 40 day ribeye. Our waiter recommend two sides, one veggie and one starch. We split an order or bourbon glazed mushrooms and mac’n’cheese with chorizo, cilantro and jalapenos. The portions were very generous and delicious – from the meat to the sides. Almost too much food for me, because I stopped eating to save room for dessert! 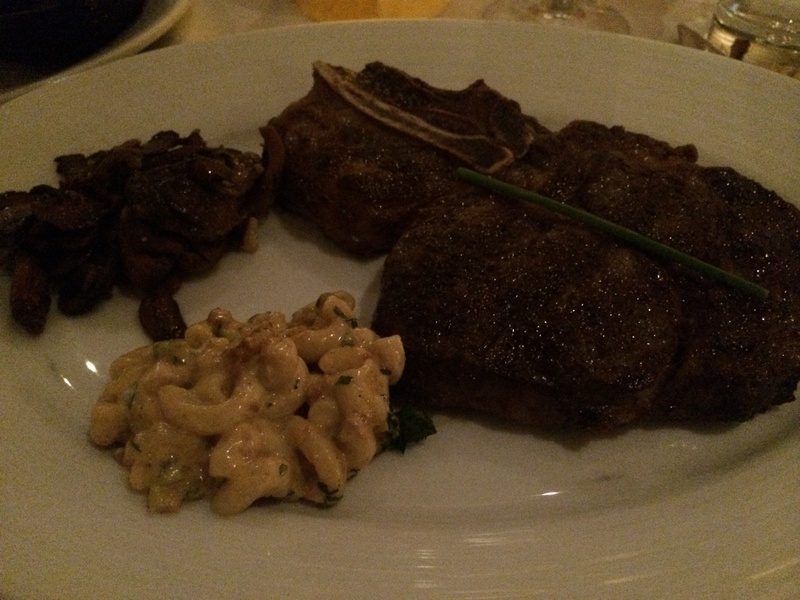 40 Day Ribeye w/ mushrooms and mac’n’cheese! The cheesecake lollipops peaked our interest as did the special of a raspberry chocolate treat. Asking our ever faithful waiter his recommendation, we went with the special, which happened to be made by the head pastry chef. And boy, I was very, very, very happy with our selection. The dessert was light, flavorful with raspberry, chocolate and mascarpone. We pretty much had to restrain ourselves from licking the plate. By the end of the night, I got a well done from Matt. With our bellies full we headed off planning on when we could return to and get more bacon sticks. Because of the wedding Matt and I are on a budget. So for Valentine’s Day we set a $15 present limit. My present to Matt was a well executed inside joke. 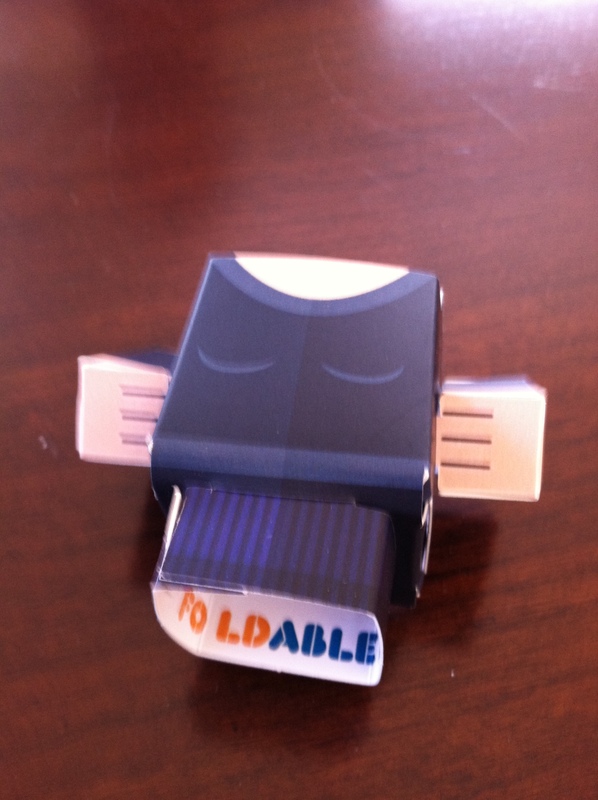 Matt however, got very creative and found the website Foldable.Me. He ordered two mini me’s. One of him and one of me. I think he did a pretty good job. What do you think? 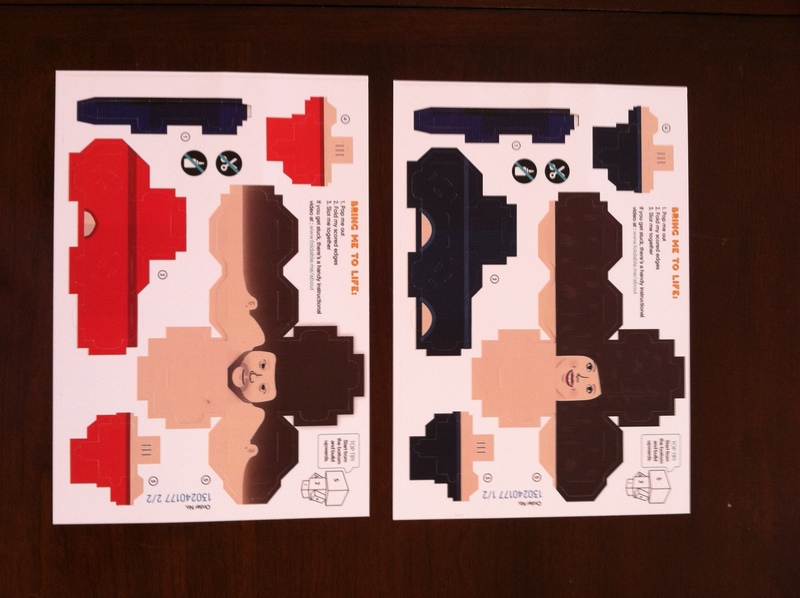 Here’s what the mini me’s look like when you first get them. This weekend we finally put them together. Sitting down at the dining room table we got to work and were done in no time. The foldables don’t need any glue or scissors. They come with a perforated edge that make’s it simple to punch out the pieces. The pieces also come ready with scored edges to help you fit the pieces together. And here is the final product. I definitely think they turned out great. Maybe a potential wedding cake topper? Who knows! 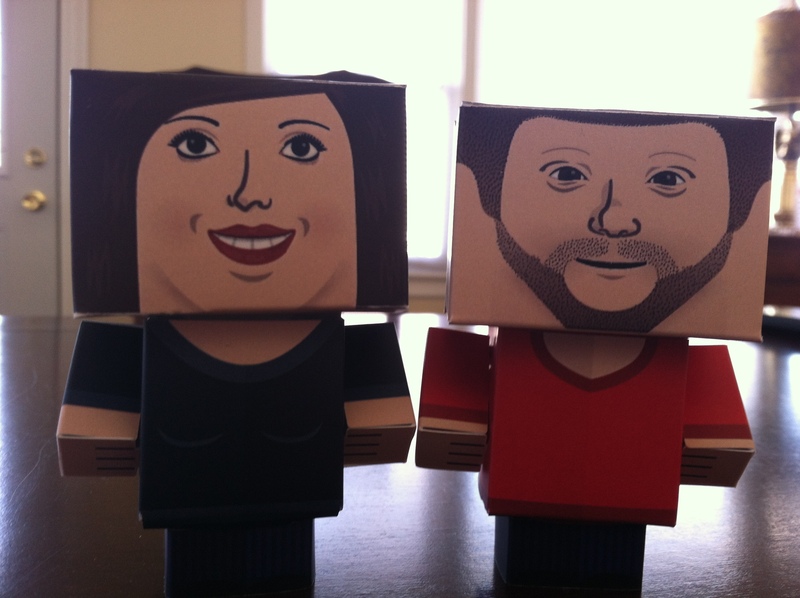 If you’re looking for a creative gift, I’d recommend Foldable.Me! I have been a cooking machine lately. My goal of one new recipe a month has been blown out of the water. February isn’t even over and I’ve made about 5 new things! Last week for Valentine’s Day Dave and I decided to forgo going out to a nice restaurant and stay in and make a fancy meal of our own. Since we didn’t have to tip a waiter we decided to treat ourselves to steak and shrimp from Whole Foods. 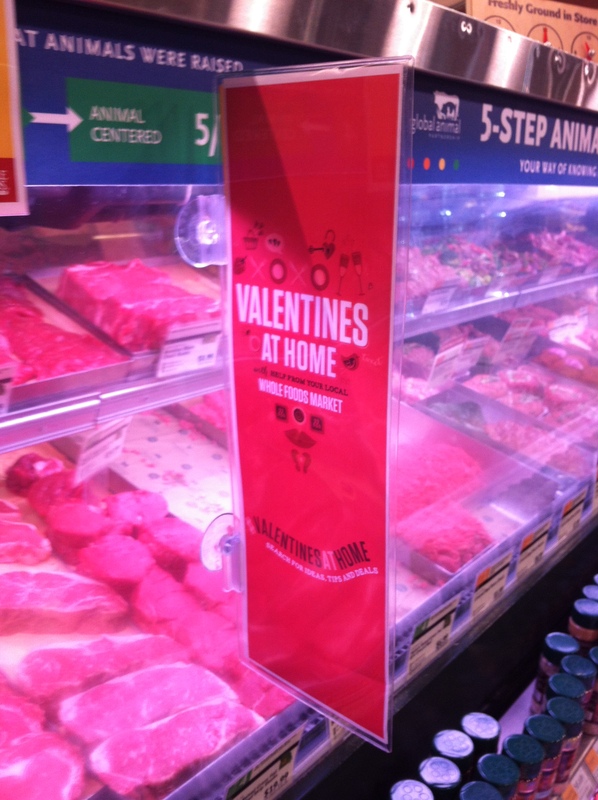 Little side note: When I got to Whole Foods, they had this signage up. I thought it was very appropriate given our plan. 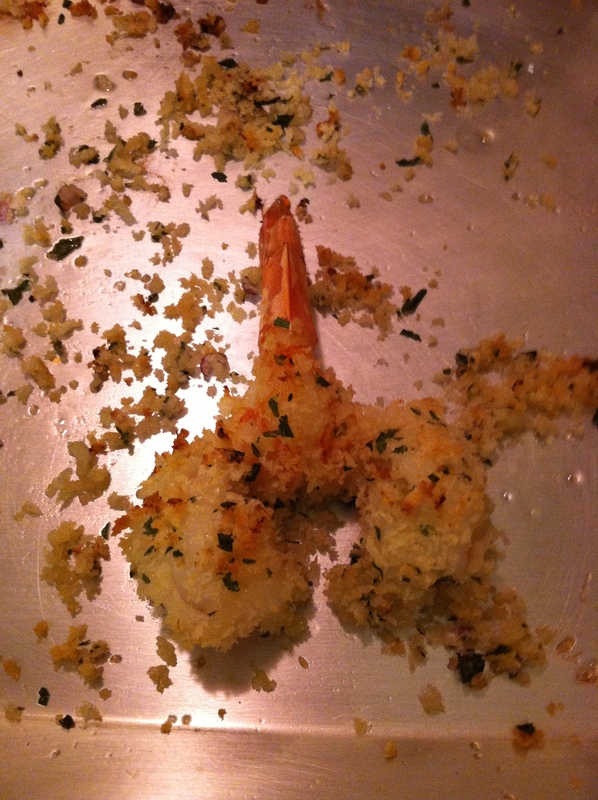 Dave asked if I could try and replicate Shrimp Alexander- a Morton Steakhouse appetizer. We ate at Morton’s about 3 years ago for an anniversary dinner. The only thing I remember was the inebriated couple next to us telling us we should get married ASAP. Dave remembers the shrimp…go figure! I started typing it into Google and this blog post by Stephanie at CopyKat Recipes was the first on the list. An hour after Dave asked me about it I got an email from him with the exact same link in it. Guess that was my shrimp recipe! Delight in how easy it was to seem fancy! Doesn’t it look like a mini lobster? Wish I was brave enough to make lobster! Maybe I’ll work my way up to that someday. I must be honest, I scoured Pinterest for some of these creative and low-cost or completely cost-free ideas. 1. I wrote on our bathroom mirror in dry erase marker. Jonathan leaves for the gym really early in the morning, and then by the time he gets home I’ve left for work. So I thought this would be a fun surprise to come home to this morning. 2. I filled an empty jar with Reese’s pieces and gave it the tag line “I love you to pieces.” This one was a little bit of a cheat, because I did have to buy the Reese’s pieces. 3. I made heart garland so he sees it when he walks in the doorway this evening. This is one of the perks of being a teacher, I have plenty of construction paper and string at my disposal, and I’ve mastered the folded-in-half heart cut out. 4. I rushed home from work today to make fresh homemade butter cookies. I used my great grandma’s recipe, but formed them into hearts and cut out two little people (using a gingerbread cookie cutter I already had!) so it looks like two little people in love. Since I adore baking, this one was at no extra cost seeing as we already had all the ingredients in our pantry. So far today, the surprises have been appreciated…can’t wait til they continue when Jonathan comes home tonight! I know the holiday is as well as past now, but these are fun things to remember for an anniversary, a future Valentines day, or just any old day to say “I love you” without breaking the bank. Over the weekend I went to see Les Mis with my sister and cousin. It was my cousin’s third time seeing it! I thought it was good, but not sure I would go a second time (or third). The thing that bothered me is that that sing everything, even small conversations. I enjoy musicals, but I guess I like them better with song numbers mixed in with normal conversations. 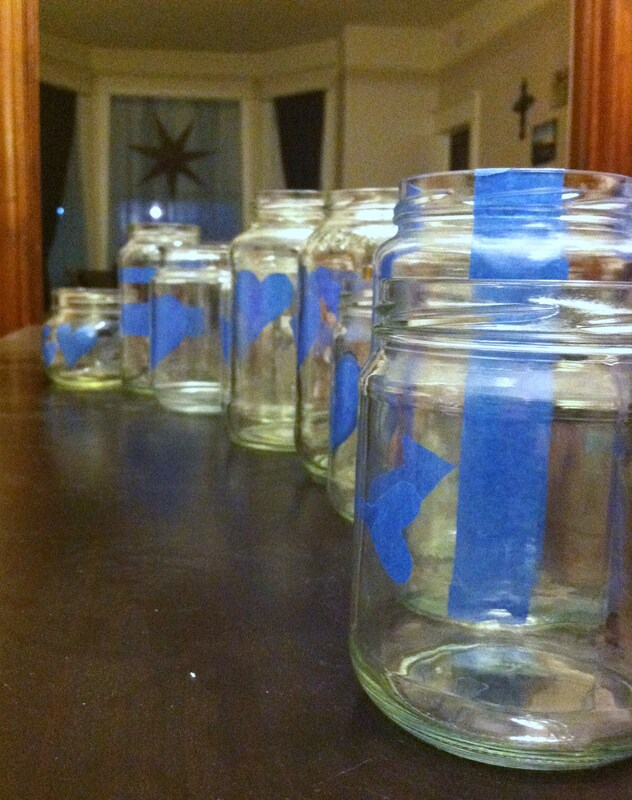 We made our way back to my apartment and started working on a mason jar project. Well really it’s an any kind of jar project. We used mason, spaghetti, candle, and relish jars. It really doesn’t matter as long as you like the shape of it. 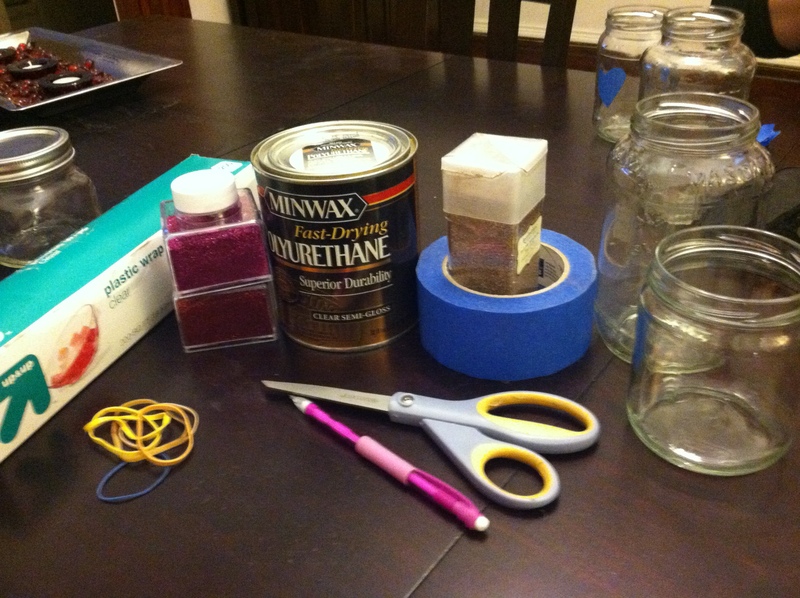 After making sure the jars were clean we gathered the rest of the supplies: Polyurethane, glitter, scissors, painters tape, writing utensils, rubber bands, plastic wrap, and tops to the jars if you have them. 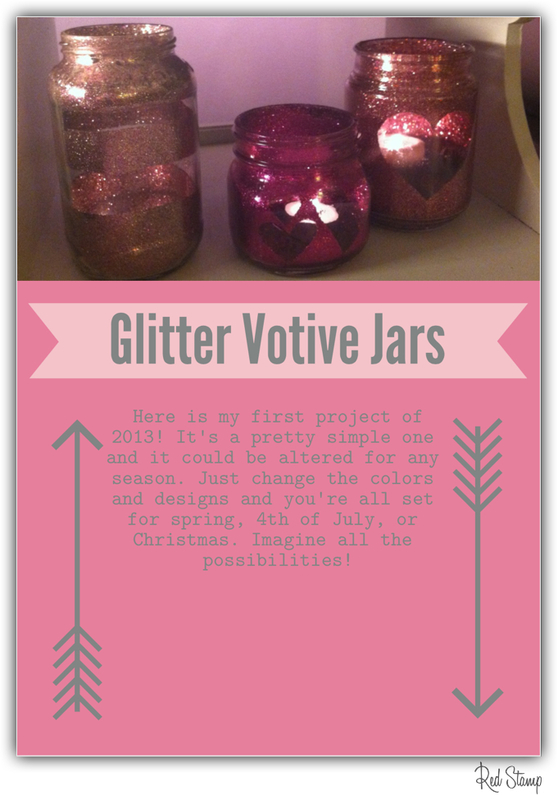 We were going to make glitter votives for Valentine’s Day! I found this project on Pinterest and then found that it linked to Jen’s blog: Tatertots & Jello. I loved her idea and the girls agreed to try it with me. Below you’ll find the steps we took mixed with some tips we learned for ourselves along the way! Choose one jar to start with. 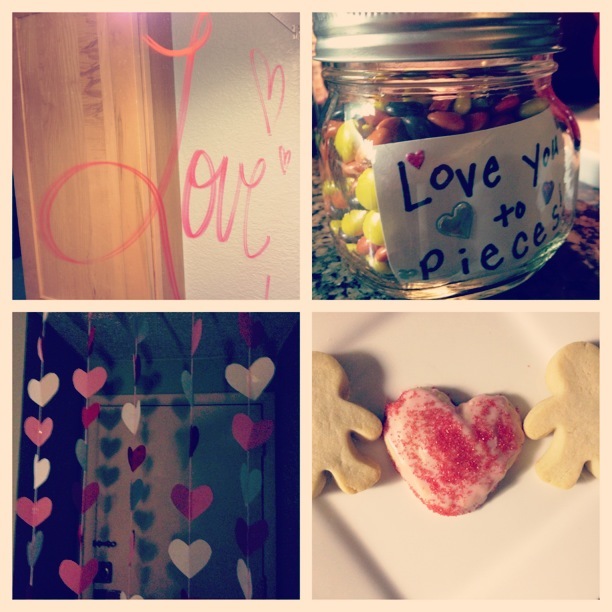 Jen suggested using vinyl to cut out heart shapes and stick in the jars. We forgot vinyl. Oops! But out of that forgetful moment came a brilliant idea (thanks Karla)! Painters tape. Most people have it around their houses and it’s pretty inexpensive to use. Cut out shapes and stick it to the inside of your jar. We got a bit creative with our shapes. Besides the traditional hearts we had initials, arrows, and stripes! I will say this is what we spent the most time on. It’s really up to you and your cutting skills. Tip- Remember that whatever you cut out needs to be stuck inside the jar meaning you’ll have to flip it over so the sticky side is against the glass. Sounds simple, but we forgot a few times and had some backwards heart halves and even letters. Pour a bit of polyurethane in the jar and screw the top on or if there is no top, place a piece of plastic wrap secured with a rubber band over the opening. Once the opening is covered, you can swirl the polyurethane around in the jar until the whole inside is coated. Remove the top and pour the excess polyurethane back into the can. 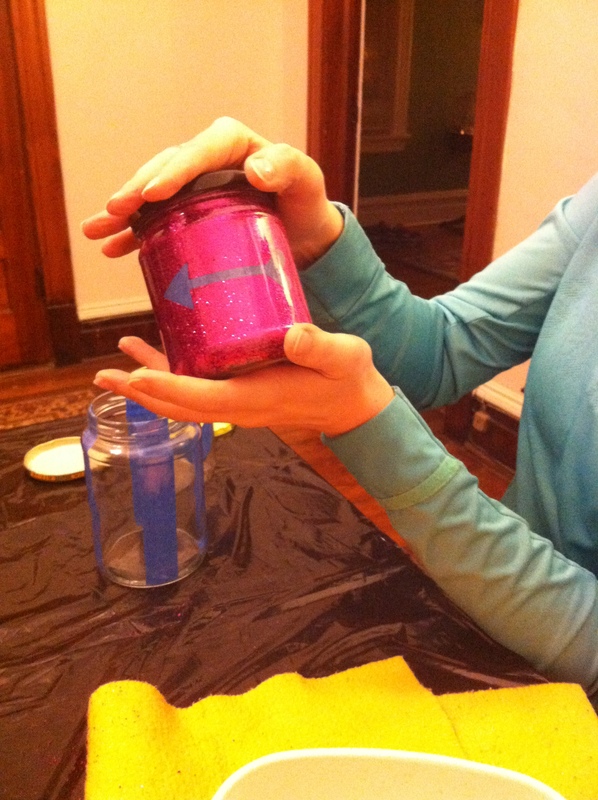 Tip- We learned on one of our first jars that if you do not pour out all the excess then once you add the glitter it will run down the sides of the jar. Patience my dears! 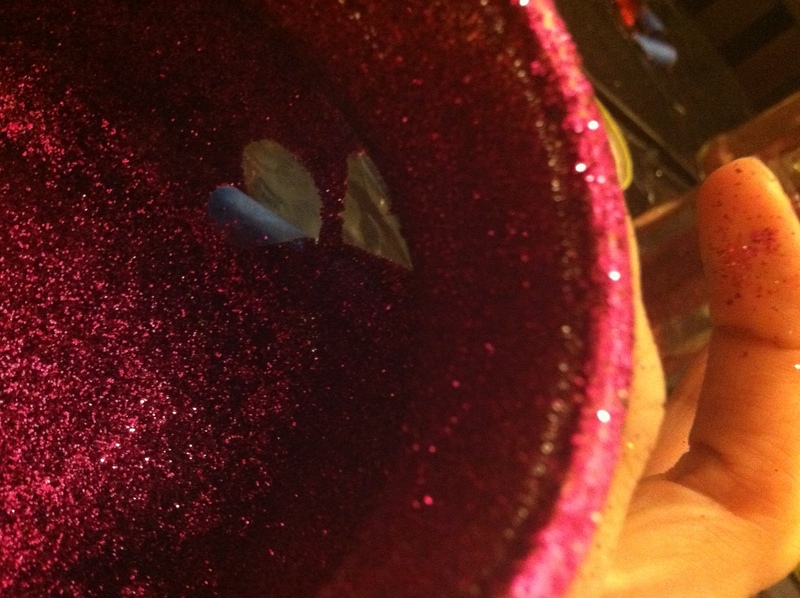 Pour a good amount of glitter into the bottom of the jar. 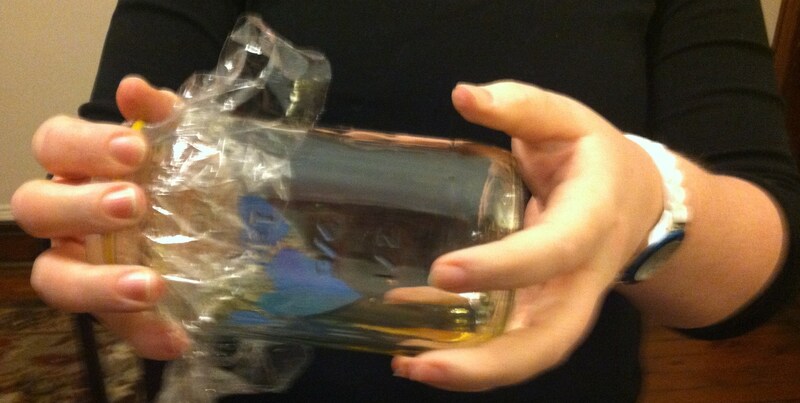 Secure the top back on the jar or have a dry piece of plastic wrap ready to rubber band on your jar. Shake that jar like a Polaroid picture! 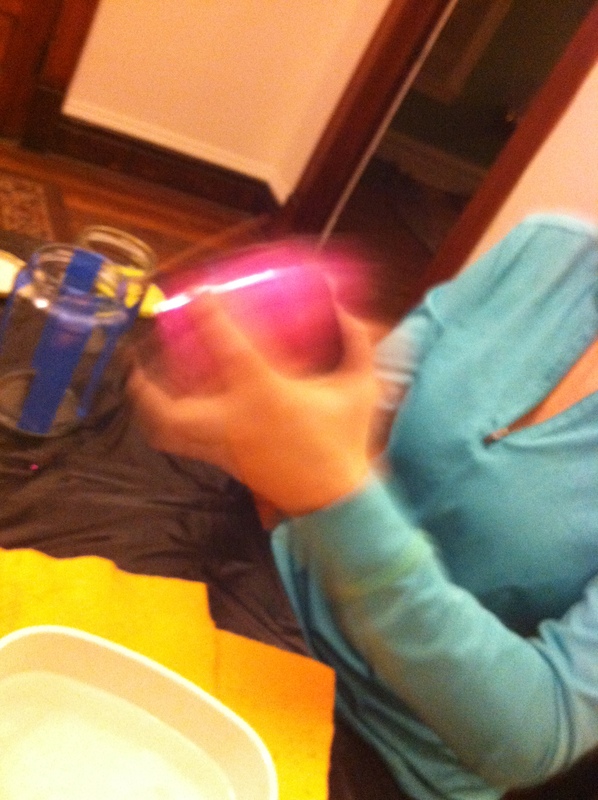 Seriously shake the jar vigorously. It’s the best way to get an even coat of glitter on the insides of the jar. Remove the covering on the jar so it can dry. Move on to the next jar until you’ve completed them all. 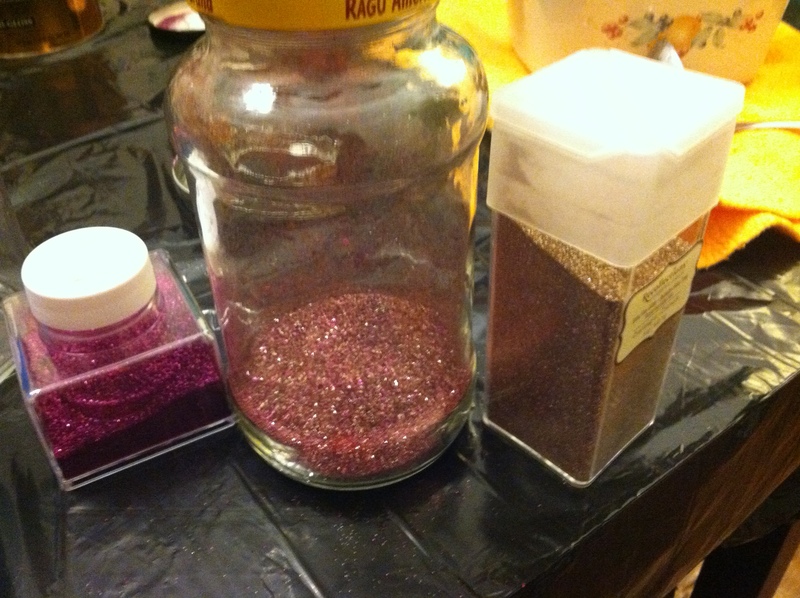 Tip- We mixed some of our glitters to make multicolored jars. I wasn’t sure how this would look, but these ended up being our favorite jars. 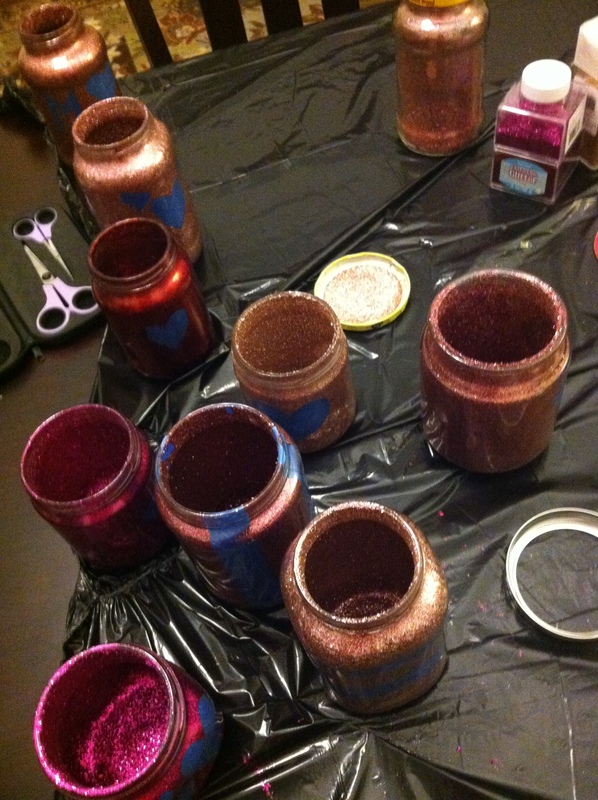 Jars are all glittered and drying! We waited a few hours for our jars to dry and right before the girls left we checked to see how they were doing. They were dry so we started peeling the tape from the jars to reveal the final product. I would say this is the hardest part. It will seem like you’ll never be able to get it out. You have to use your fingernail to scratch glitter off the tape and find an edge you can peel. I would say the hearts were the easiest to remove. 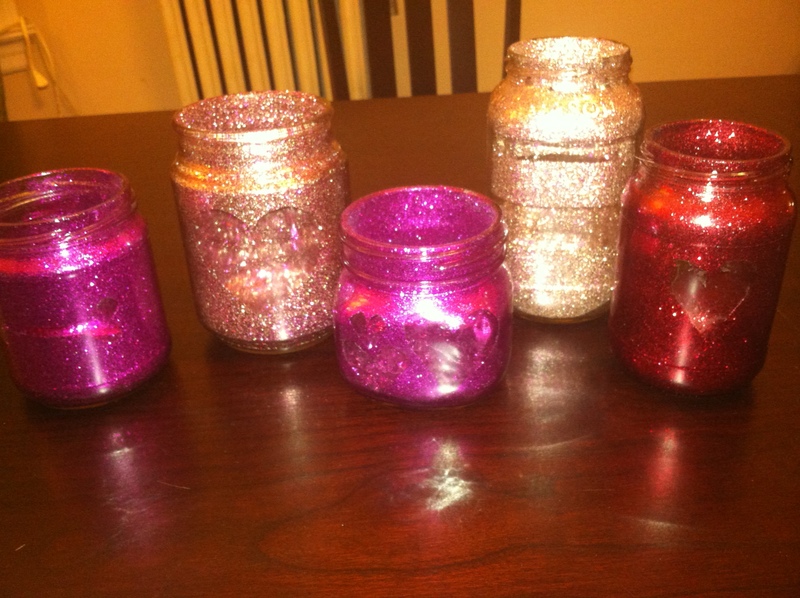 Some of our completed jars! All in all it was a pretty easy project that was also inexpensive to do. We already had almost everything. In our case we only had to buy glitter. Oh and Jen’s post does advise people to use flameless candles. Someone commented and noted that when polyurethane dries it loses its flammable-ness. I tried real candles and didn’t have a problem, but as always with candles, make sure they stay attended by an adult. 10) Getting snail mail…there’s something so nice about receiving a colorful card in the mail that you can actually hold. 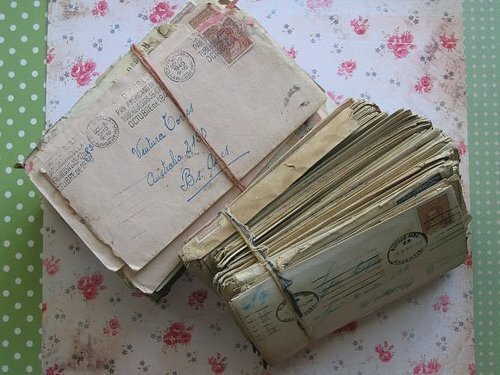 Email’s nice too, but snail mail is better. 9) Hearing a song on the radio that makes me sing out loud…I was doing this the other day at a stoplight, when I looked next to me and realized that a preteen girl with her mother was staring at me like I had 3 heads. It was such a good one though, that I kept singing anyway. 8 ) Thinking up something creative…I’ve been feeling very crafty lately, and have been coming up with new foldables and projects for my students to make things more interesting. I know it’s super nerdy teacher-esque, but every time I come up with something new I feel good. 7) Getting flowers…and Jonathan knows it. He’s a really good flower picker, abnormally so for a guy. 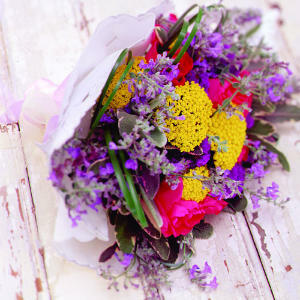 But every holiday I get fresh flowers that bring a big smile to my face. I know some people just say flowers die, but something about having that colorful burst of life in your home for even a few short days is uplifting. 6) A glass of wine after a hard day…there’s nothing more relaxing than curling up in my PJs on the couch with a glass of red, catching up on my shows or reading my Kindle. 5) Text messages just to say hi…it’s nice knowing people are thinking about you, not necessarily needing you for something. I love getting a random hello in the middle of the day. 4) Buying a new pair of shoes…I know they just stay on your feet all day, but glancing down and seeing a shiny new pair of shoes that make you look just that much cuter is a nice feeling. 3) When kids are thoughtful…there are a lot of things that you see kids doing these days that make them seem selfish and unaware of others. But this Valentine’s day my students were really sweet to each other. And one even suggested that we all make cards for our special ed reading buddies AND our pen pals to brighten their days. 2) Panda bears…if you know me, you already know this one. But even if you don’t know me, you can’t deny it. Want scientific proof why humans are so mysteriously attracted to these big huggables? Check this out>>>Why we love pandas. 1) Finishing a book…sometimes in the midst of all the crazy in life, it’s nice to know that you can actually still finish things once in a while. And finishing a book is very satisfying.